Levan Kharanauli is a Georgian painter. He was born into a family that has special connections with words and language. Levan’s father, Besik Kharanauli, is a gifted poet, originally from the mountainous region of Georgia. In 2011 he was nominated for the Nobel Prize in literature. Although he is the author of numerous books of poetry and the editor of several journals, when he is in his native mountains he is a shepherd. Levan’s mother, Damana Melikishvili, is a philologist, a university professor and the representative of an old noble family. The painter has inherited an exquisite aristocratic sensibility from his ancestors, along with an aspiration to catch on canvas what is impossible to catch. Levan has a wife, Lela, and seven children. 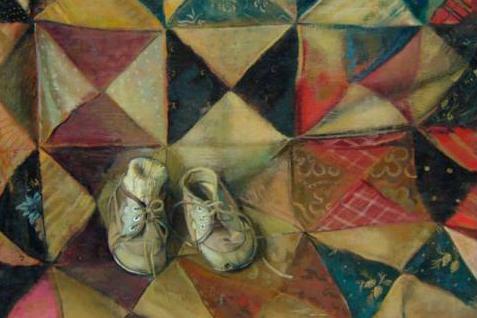 Baby Shoes is a series of pictures that represents his personal family’s history, which he moved to the canvas and thus gained a completely new quality. This all started with shoes that were first worn by the eldest daughter of the painter, Mariam, then by his son Qito, followed by Besik, Elene, Giorgi, Pepo and Marta. Two little worn-out shoes, part of the story of different family members as well as part of the family’s shared biography, standing for childhood, tradition, warmth and love. At first the artist was attracted to this subject just by how the shoes looked. 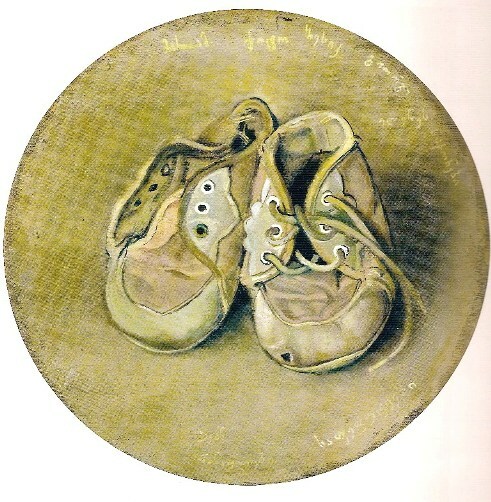 One of the first pictures of the series represents two little brownish worn-out shoes in a round frame with a brown-gray background. The names of children and a sentence that they wore these shoes are written on the picture. They seem to be proof that the image documents reality. Next other details appear on the flat surface of the painting together with the shoes. In one case this is a bird’s nest and a dandelion, while another one shows a flower pot attached to the wall. The shoes start to live together with other objects and gradually turn into personified characters. The paintings represent their first considerations, questions and the new opportunities presented to them. Through the brown-gray background time and place are generalized. The shoes rest calmly besides each other. The next painting, however, is multicolored and indicates a specific place. The story unfolds. Our protagonists are represented on a sofa, which is covered by a quilted surface composed of checked red, blue, violet and ochre triangles. At first glance the shoes do not occupy a large part of the picture surface, yet the whole space is submitted to them. We get the feeling that the shoes feel quite comfortable. A white sock sticks out from one of them. The years of observation have passed. It is now time to start making decisions. In the last picture the shoes are marching through an enchanting landscape. One can see flourishing flowers of various species and colour and trees with white blossoms. The barrier between the sky and the ground has been erased. It is spring, or summer, or maybe eternity. This is the beginning of a completely new story. One thing is certain: wherever they go the shoes will take with them this family’s history – childhood, tradition, warmth and love. Levan and Lela Kharanauli’s daughter, Mariam, will soon become a mother and their son, Qito, a father. 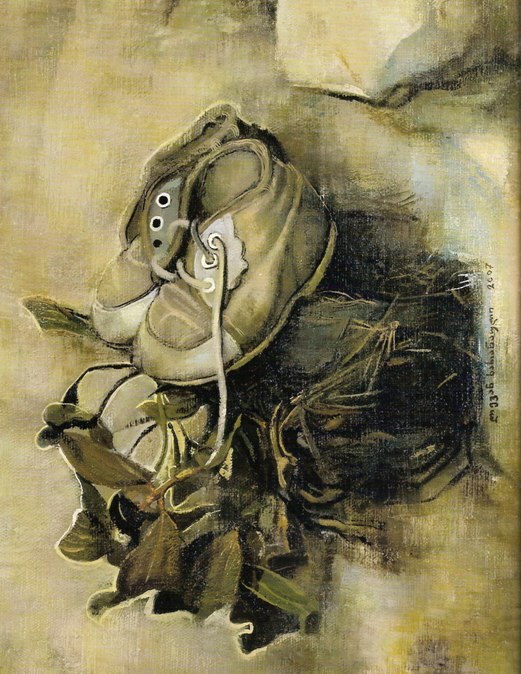 Levan Kharanauli: Baby Shoes Series, 2006 – 2007: 1) 21×47 cm, oil on canvas; 2) diameter 25 cm, oil on canvas; 3) 40× 30 cm, oil on canvas; 4) 60×61,5 cm, oil on veneer; 5) 27×77 cm, oil on calico. Levan Kharanauli was born in 1963 inTbilisi, Georgia. He graduated from Tbilisi State Academy of Arts (Faculty of Fine Arts) in 1986. He has regularly participated in exhibitions in Georgia and abroad. His works are located in galleries and private collections in Italy, Germany,France, Spain, Luxembourg and Georgia. Anna Mgaloblishvili is a Georgian painter and art historian. She studied painting at the Tbilisi State Academy of Fine Arts. She has regularly participated in exhibitions in Georgia and abroad and has curated several art projects. In 2004 she received her Ph.D. in art history. Her thesis was about the development of church painting in Georgia at the beginning of the 20th century (1900-1921). Since 2006 she has been a professor in the Department of Art History and Theory at the Tbilisi State Academy of Arts. Contact:a_mgalobeli@yahoo.com.